“Farro is an ancient grain making a huge comeback. It looks and tastes like wheat berries and has a nutty flavor. You’ll also find plenty of nutrients such as B vitamins and protein (4 grams in 1/2 cup, cooked) as well as fiber. You’ll also find it loaded with antioxidants, phytonutrients, lignans and betaine. 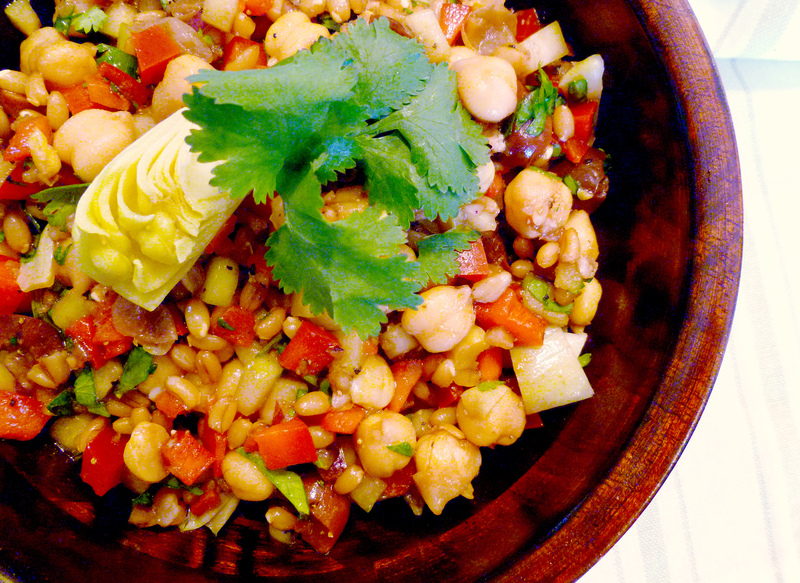 I love to use farro or wheat berries as a grain salad. I find these types of dishes are perfect for summertime since unlike other salads, you can make them ahead of time and pop the in the refrigerator to make for a perfect snack or lunch. They also are great for taking with you to work or on the go. This particular Greek version has a nice bright punch with the acidic dressing that is balanced with the fresh cucumber and bell pepper. 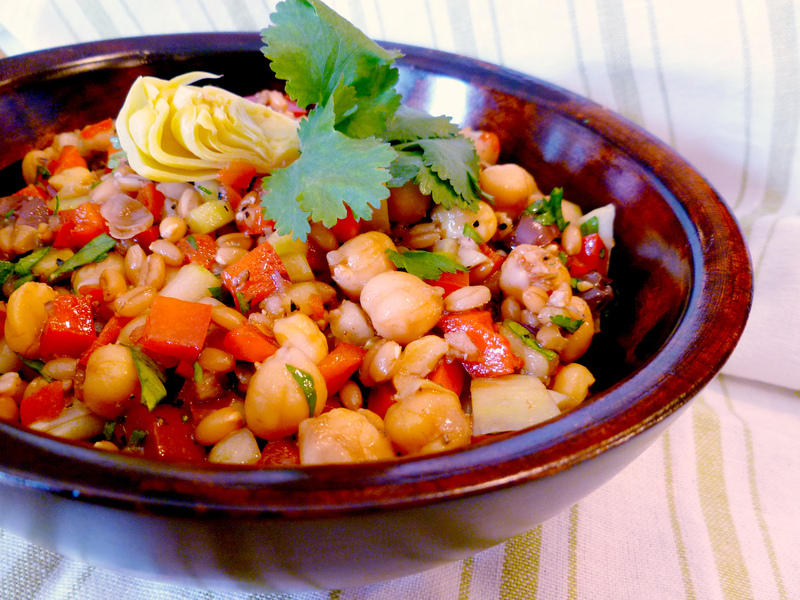 With the combo of farro and chickpeas, this is also high in protein, perfect for a post workout snack. 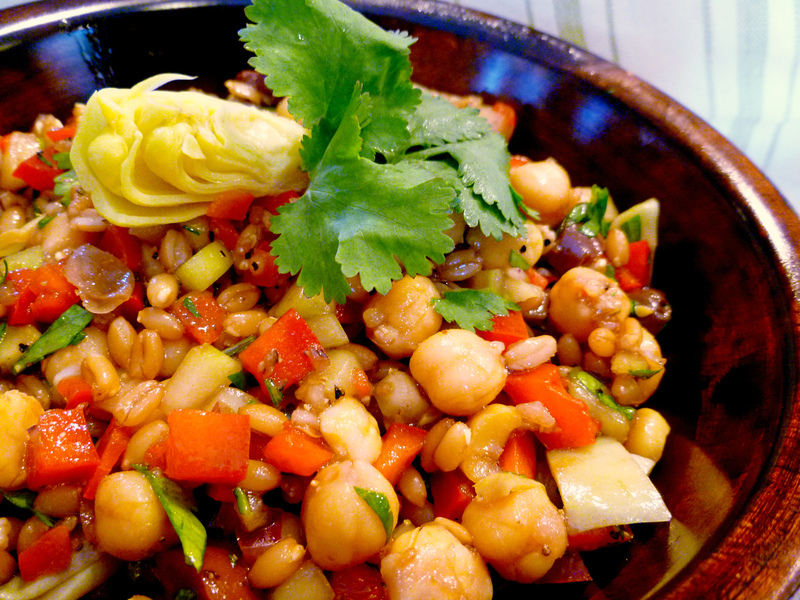 In a large bowl, combine the farro, chickpeas, cucumber, red pepper, onion, artichoke hearts and olives. In a smaller bowl whisk the olive oil, vinegar, lemon juice, garlic and salt until well combined. Add pepper to taste. If you prefer a touch of sweetness, add in a tsp or so of agave nectar but be careful with it. This should be fairly acidic and as as the salad is mixed together, the acidity will not be as strong. Add in parsley or cilantro if using along with feta if you are not concerned with making this vegan. Footnotes: Farro is an ancient grain consisting of certain wheat species in whole form. Because its is hard to grow, farro almost became extinct during the 1940’s. However, it is now making a big comeback especially in Italy where top restaurants feature it in soups and side dishes. It has a pleasant nuttiness and a hearty texture and is naturally high in fiber, protein and B vitamins. You can find this lovely little gem in the bulk section of health food stores. It looks just like other wheat berries or barley and if you can’t find it, or if it’s too expensive where you live, substitute it with any other wheat berry. They take about 45 minutes to an hour or so to prepare. Just put a pot of salted water on the stove and boil them until they are soft and chewy. Some like theirs a bit firmer, I usually boil mine for about an hour or 1 hour and 15 minutes as my family prefer them less chewy. To reduce the cooking time, you can also soak them overnight. Kalamata olives add a strong, sour flavor that compliments Greek cuisine. If you don’t have a taste for these, you can use black olives instead or leave them out entirely. I’m not a huge fan of canned goods. But when it comes to artichoke hearts, I always go the canned form as I don’t have time for the alternative. If you buy them canned you’ll have quite a few left over. I like to take an extra one and garnish each plate with one. But, if you don’t have access to these or if they are too expensive, it’s fine to just leave them out. Tomatoes would taste wonderful in this salad. If you want to use them, seed them first then dice them up. However, if you plan on storing this as leftovers, you may want to leave them out. Tomatoes turn watery in the refrigerator so it may make the salad soggy. This is why I use red peppers instead. I know! I forget about them too. This is a good way to sneak them in now and then.